Use a paper cup as the base for this easy to make pilgrim’s hat, which is ideal to set at each place setting for Thanksgiving dinner. Cut the bottom out of the paper cup. Cover the outside of the cup with glue and wrap the cup with black yarn until it is completely covered. Set aside to let dry. Cut a 4-inch circle from the lightweight cardboard. Cut a 4-inch circle from the black felt. Glue the felt piece to the lightweight cardboard piece. This will be the hat brim. Glue the wide edge of the paper cup to the felt side of the hat brim. Make sure the cup is centered on the hat brim. Cut a 6½ x ¾ inch piece of blue felt. Glue the blue felt piece around the cup above the hat brim. Cut a small red buckle out of the red felt. Glue the red buckle over the blue band in the front of your hat. 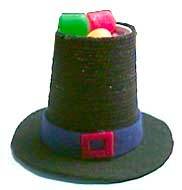 Now you can fill your hat with treats and place it at the table for your Thanksgiving dinner. Project originally contributed by Heidi Ott, owner of the Crafter’s Community web site.